It has been a few years now since I learned about my ancestor William Z. Morey, who served on the side of the Union during the Civil War. At the age of 44, William enlisted as a private in the 26th Regiment, Massachusetts infantry, company H.
In November of 1861, the 26th regiment was ordered to report to General Butler. Sailing from Boston on the Constitution, they arrived on Ship Island off the coast of Mississippi on December 3, 1861. It was here that William worked chopping wood, while Butler’s forces were readying themselves for their big move on New Orleans. In April of 1862, the mouth of the Mississippi River was opened to the Union army by the success of Farragut’s fleet, which led to the occupation of forts St. Phillip and Jackson by the 26th Regiment. In July of the same year, the 26th regiment moved on to occupy the city of New Orleans. This is where my 4th great grandfather’s regiment stayed until the summer of 1863. However, the journey ended for William on January 12, 1863 when he died in a New Orleans Hospital. 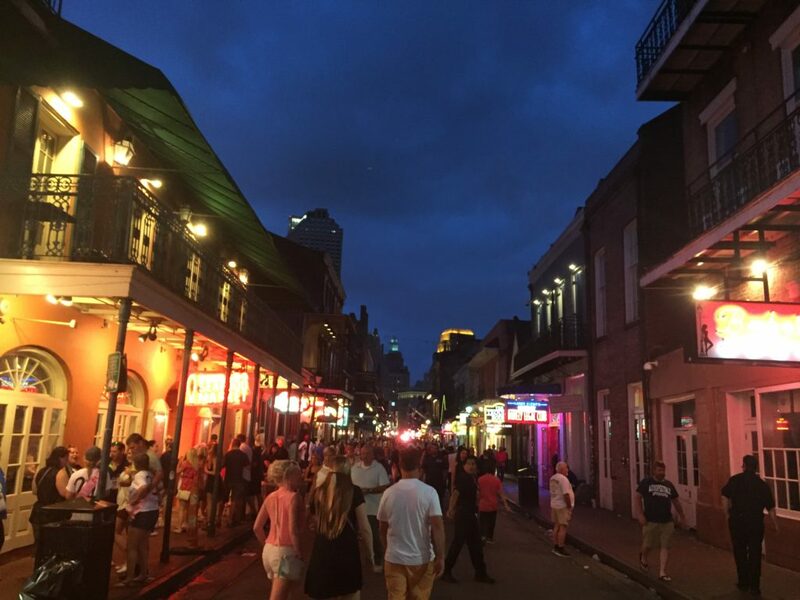 Up until I learned of William, New Orleans is where I had my first drink. It was a place that revolved around food, music, old cemeteries, mysterious swamp stories, voodoo and of course, Mardi Gras. New Orleans was never a stop I associated with the Civil War. 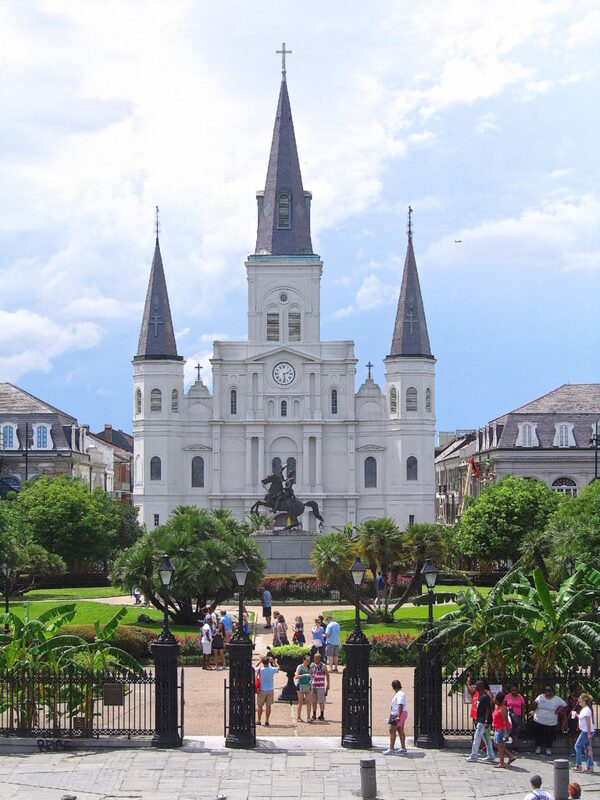 With the generous help of Holiday Inn and inspired by my family’s personal connection to the city and time period, I decided to revisit New Orleans in hopes of getting a unique view of the city through it’s Civil War history. 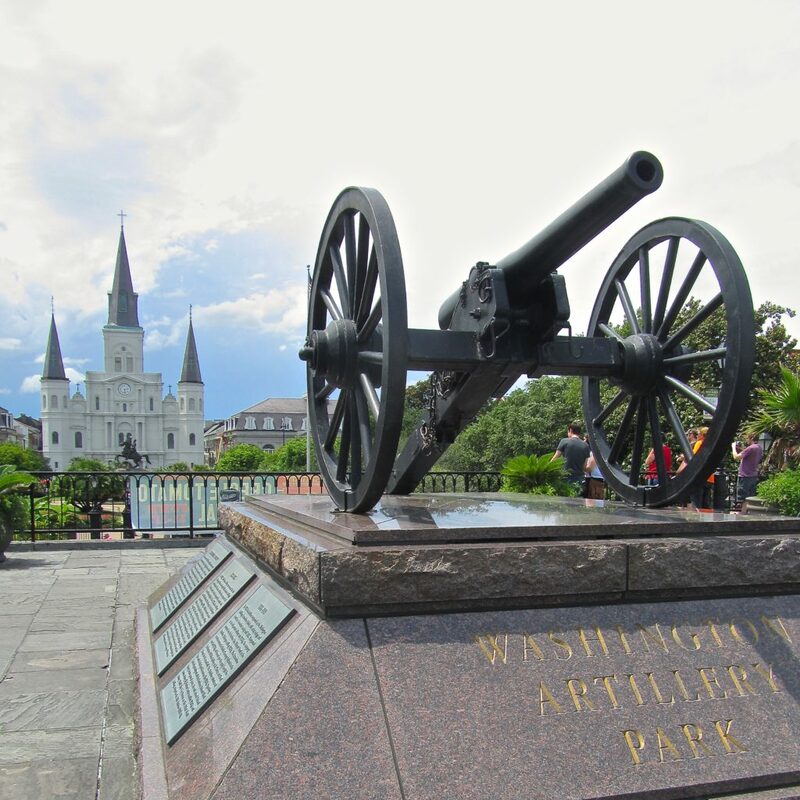 My first introduction to the city’s Civil War history was through a Civil War French Quarter tour with Civil War Tours of New Orleans. Owned, operated and created by Nic Clark, the walking tour lasted about three hours and covered everything from secession to Union occupation. 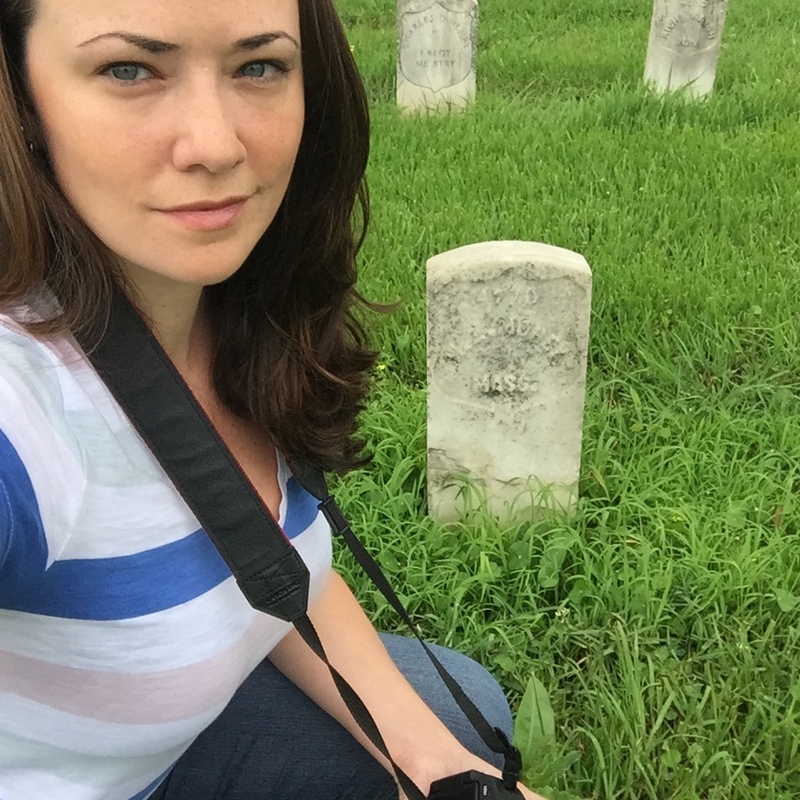 With a love for Civil War study that spans over 20 years, over a decade of experience as a tour guide and a degree in History from Centenary College of Louisiana, Nic was like a walking encyclopedia. There wasn’t one question he didn’t have an answer for – his knowledge on the topic was pretty impressive! 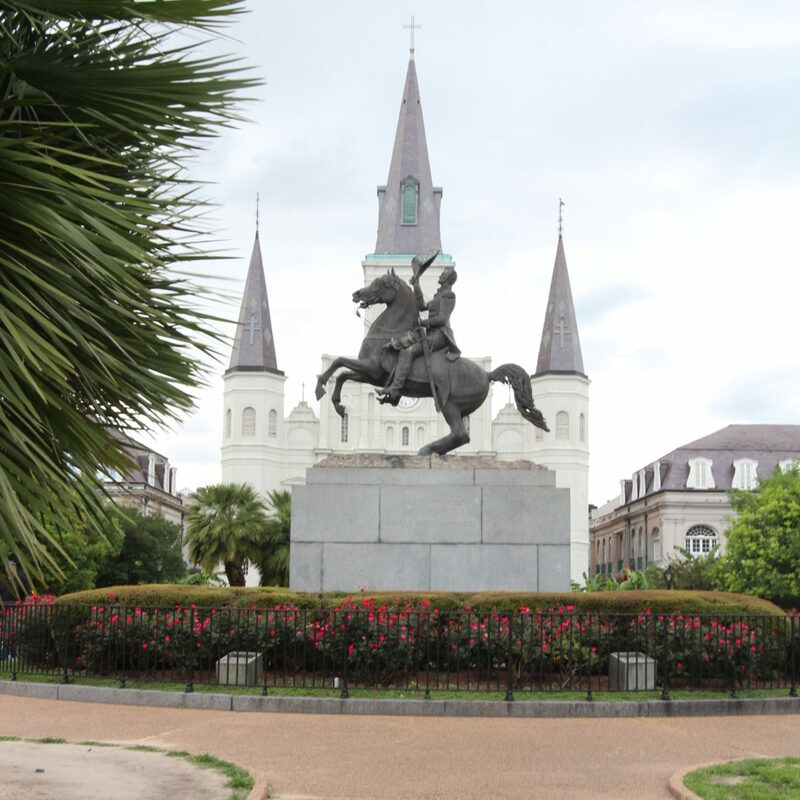 Although there were many points of interest covered on the tour, I wanted to share with you the ones I enjoyed most… the most surprising, lost little details (unknown to many visitors) on how the Civil War has played a part in shaping New Orleans culture. Located a short 10-15 minute walk from Holiday Inn Chateau Lemoyne, Tujagues was not only the first stop on the tour – it was one of my favorites. Nick explained that much of the bar remained the same as it had back when it was a popular hangout for Union soldiers. The soldiers would have walked through the same door, would have belly upped to the same bar and looked into the same mirror that you do today. What put this stop on my list though… were the coffee cups. 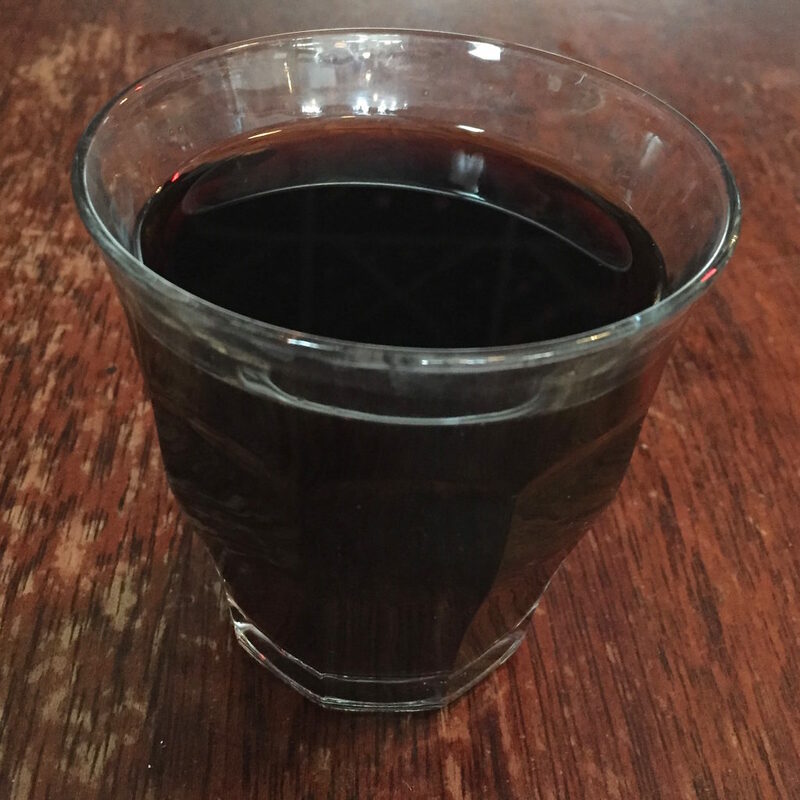 Nick made a point of ordering a coffee so I could see what it was served in – a plain old glass tumbler. This is when I got a lesson on the Confiscation Acts of 1861 and 1862, which allowed Union forces to confiscate Confederate property. From weapons to slaves, right down to silverware and fine china – whatever wasn’t nailed down and held value could be confiscated. The decision to continue using cheap, glass tumblers are a defiant, daily reminder of when the city was ransacked by the Union army. 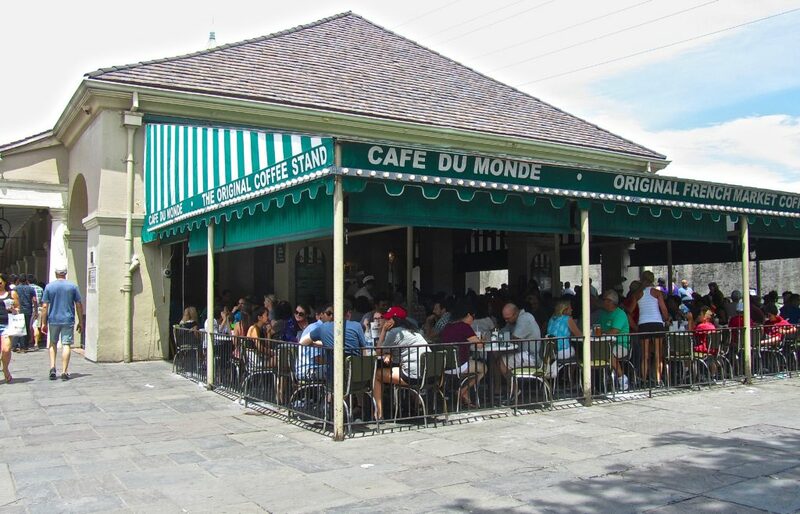 Popular with both locals and tourists, Café Du Monde has become a New Orleans landmark and tradition since opening in 1862. 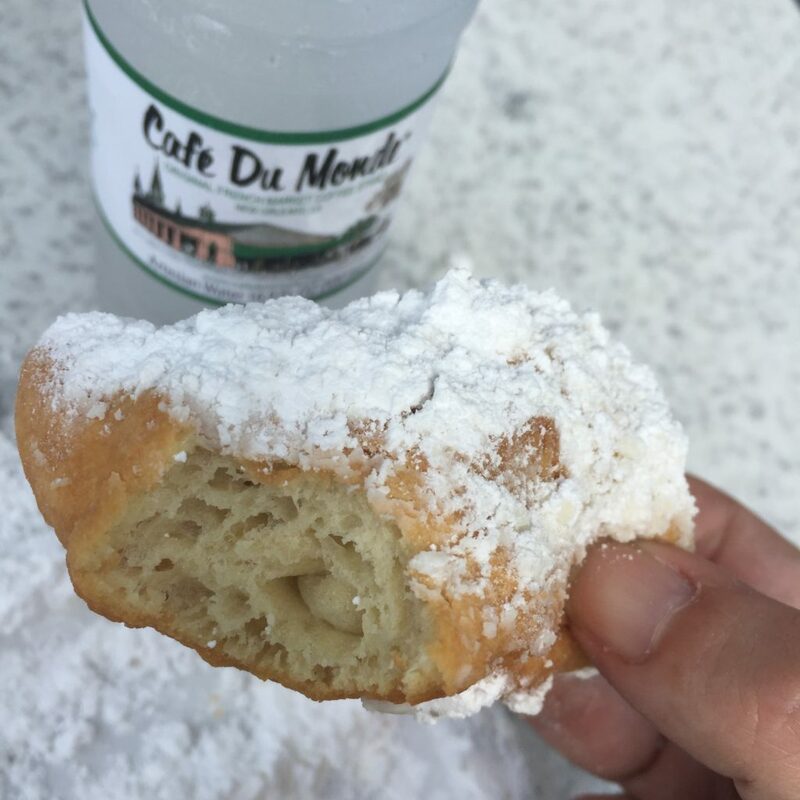 24 hours a day, 7 days a week – you will find patrons covered in powdered sugar, while enjoying their beignets, and chatting over cups of chicory coffee. While beignets are delicious and understandingly popular, have you ever wondered how chicory coffee became a New Orleans’ staple? During the Civil War, the port of New Orleans was slapped with a blockade that was put in place by the Union Army. While the act crippled the local economy, New Orleanians were forced to find creative ways of making due with supplies they had on hand. Being the second largest importer of coffee in the United States, the people of New Orleans decided to cut their coffee with another ingredient to stretch their remaining supply. Although New Orleans was not the first to use chicory as a coffee substitute, I was surprised to learn that the use of chicory in New Orleans is a direct result of the blockade that was placed on New Orleans during the Civil War. As to why New Orleanians still drink chicory today, Nic speculated it could be attributed to combination of tradition, an acquired taste or again, a defiant reminder of the city’s past. 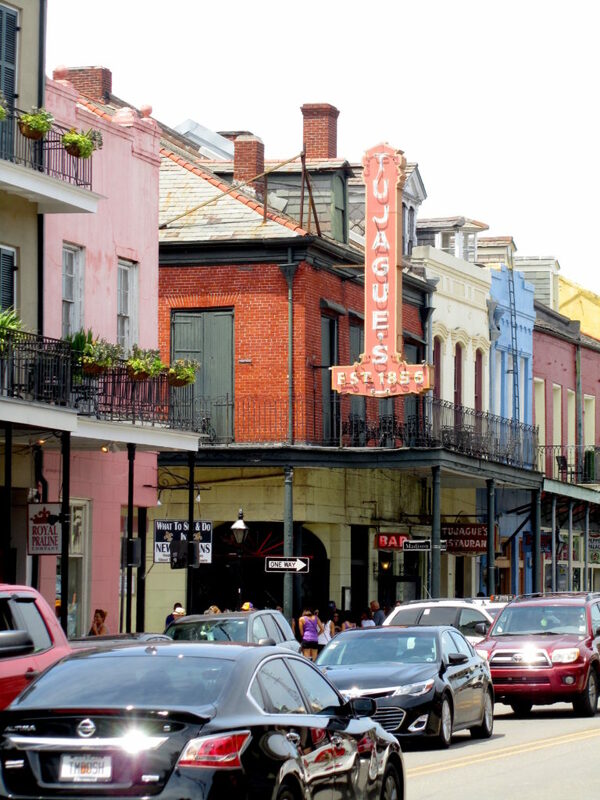 While touring the French Quarter with Nic, the last thing I expected to hear was that Butler was from Lowell, Massachusetts – the town of my birth. On this third stop, I learned several things of interest about the disliked Union General Benjamin Butler, the treatment of Union soldiers in New Orleans, confiscated goods that made their way to Boston, as well as a mark Butler left on Jackson Square. Benjamin Butler was known in the North as a successful lawyer, a controversial Major General in the Civil War and politician, who served as a Massachusetts congressman and as the 33rd Governor of Massachusetts. Known as “Beastly” Butler in the South, he was strongly despised and is still disliked today. One of Butler’s most notorious and widely disliked orders was Butler’s General Order No. 28, which was put in place on May 15, 1862. Butler looked to put an end to the unlady-like behavior. The act basically stated, if a woman were to openly mistreat any United States soldier or officer… it was then acceptable to treat her like a common prostitute. Although the purpose of Butler’s act was to tell the women of New Orleans – if you weren’t going to behave like a lady, you wouldn’t be treated like one – it opened the door to women of the city being assaulted by less than respectable men who perversely twisted the intention of the act. I can see why Butler would have been hated. In addition to acts like the one above, Butler was known for his questionable behavior when it came to the Confiscation Acts. Butler was known for seizing everything from property, to cotton and other personal belongings of value from New Orleanians he deemed disloyal to the United States. Adding salt to the already festering wound, Nic said Bulter would then sell these goods at rigged auctions – making a personal profit off of the confiscated property. During this part of the tour I was surprised to learn, one of the many things looted… errr confiscated… from New Orleans by Butler were five bronze-colored bells that were sold to a church in Boston. Another unexpected connection to home! After all these years, there is still at least one physical mark left on New Orleans from Butler. To check it out, Nic brought me to Jackson Square to have a look at the statue of General Andrew Jackson. The statue, which was erected before Butler’s arrival, sits on a large stone base in the center of the square. Just beneath the statue, “Beastly” Butler had the words “The Union Must and Shall Be Preserved” engraved …serving as a final reminder (or dig) of the city’s fall, which goes unnoticed by most today. For as long as I have known about my Civil War ancestor William Z. Morey, I have struggled to locate the hospital he passed away in. Every document I have lists his place of death as St. James General Hospital in New Orleans, LA… cause of death consumption. With every new search on its location, I hit a new dead end – until I met Nic. Although St. James was not on his Civil War French Quarter Tour, I have to credit Nic for helping me break through this brick wall. When Union forces occupied New Orleans, it wasn’t uncommon for them to use local hotels as makeshift hospitals. So, the hospital William died in was actually St. James Hotel – used and referred to as St. James General Hospital during the war. Once Nic filled me in on this little secret, I was bummed to learn the hotel had moved a couple of doors down and it’s original location was torn down in the late 1800’s to make way for the Board of Trade Plaza. Being the persistent (annoying) person that I am… I decided to reach out to several local historical societies as well as The Board of Trade Plaza, in hopes they might have more information on the original St. James… or with any luck – a photo of the old building. I have had no luck finding a photo, however chairmen from the Board of Trade Plaza were kind enough to leave me a book titled, 316 Magazine Street March 16, 1968 Plaza Dedication – The New Orleans Board of Trade, Ltd written by Edward J. Cocke. The book dives into the history of New Orleans and The Board of Trade Plaza… which included a couple of blurbs on the St. James Hotel. 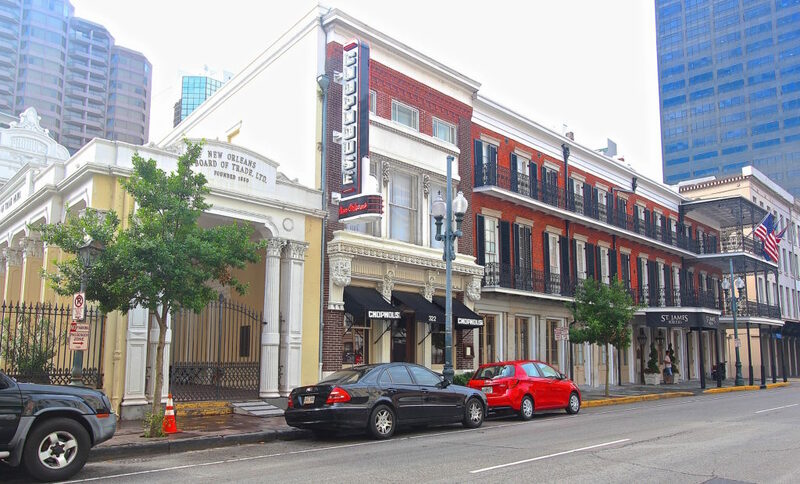 Located on Magazine St., the St. James Hotel was built in 1856 and was considered a fine hotel for its time. Just five years later, the hotel began to serve as a Union hospital until 1865. My ancestor William, was admitted into St. James Hospital on January 1, 1863… dying 11 days later on January 12th of consumption. According to the book, the entrance to the Board of Trade Plaza was hidden by a five story structure that stood in front of it, the St. James Hotel. In 1889, the hotel was bought by the Board of Trade to serve as an annex and the lobby was renovated into an elaborate, open air entrance way from Magazine St. Once the building was bought, St. James hotel moved to another location just a few doors down from the original structure. While I was upset to learn the original hotel was gone, I was happy to learn elements from the old building were salvaged to decorate the open air entrance way into the Board of Trade and it’s courtyard. According to the book, the “square Corinthian cast iron columns and arches” from the first floor of the St. James were reused in the entrance of the Board of Trade (pictured above on the right). In addition to the columns and arches, they also utilized “the cast iron arched lintels of the fifth story windows to form a blind arcade of five arches, corresponding in detail and spacing to the original windows of the old hotel…” to decorate the opposite side of the plaza (pictured above on the left behind the trees). 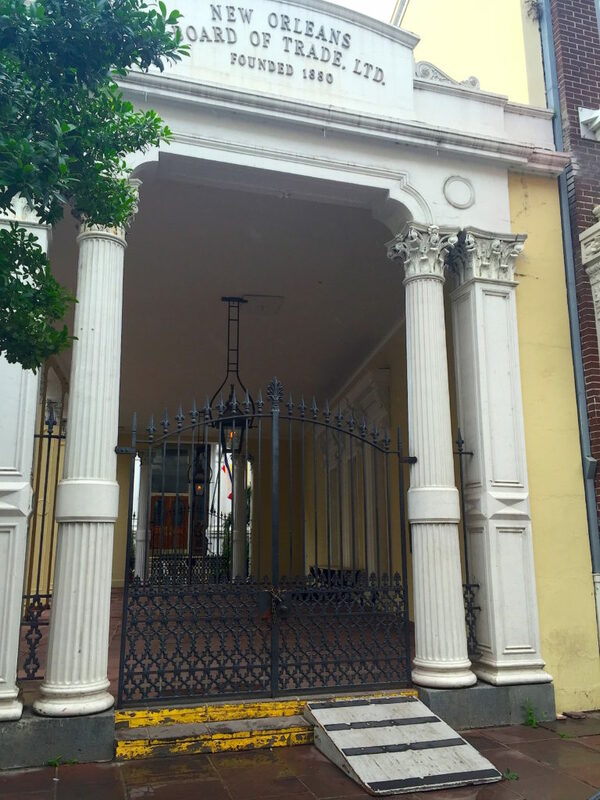 They also reconstructed three of the six original window openings with the “cast iron cornices and consoles” from the third floor of the old hotel to decorate the inside of the open air entrance. Looking past the main gate in the photo above, you can see these details decorating the inside wall on the right. Even though the actual building is long gone… the character of the original St. James has been carried over into the open air entrance and courtyard of the Board of Trade Plaza. While Oak Alley Plantation is not located in New Orleans, I felt that it was important to visit a plantation since they played a huge part in the Civil War and would have been directly affected by the war and blockade in New Orleans. 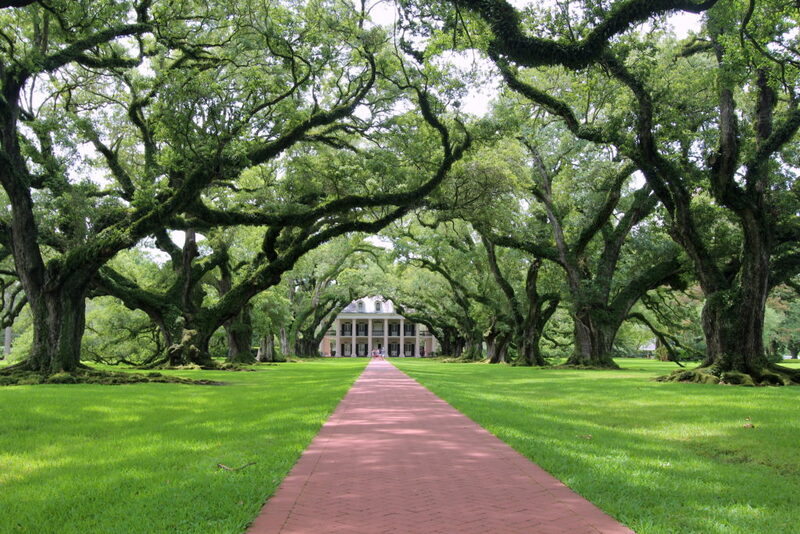 Located an hour west of Holiday Inn Chateau Lemoyne in New Orleans, I was excited to revisit Oak Alley Plantation. 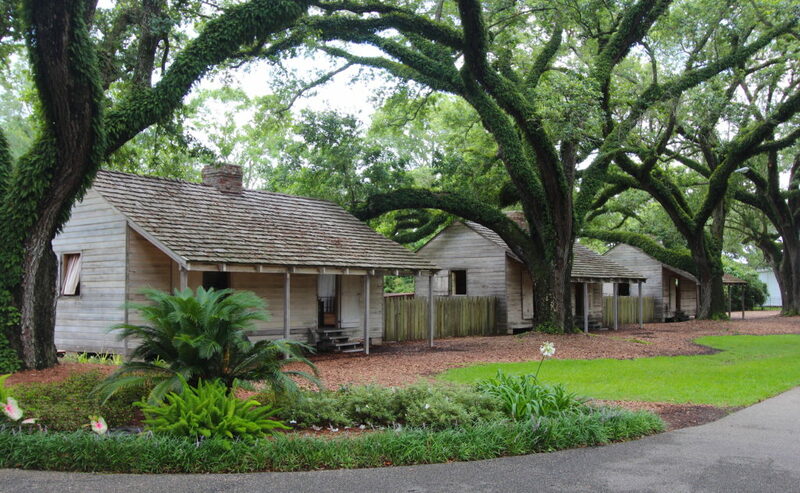 Known for it’s beautiful oak lined entrance and appearances in popular TV shows and movies like Interview with a Vampire – I have always appreciated Oak Alley’s straight forward approach in teaching the history of plantation life. Situated on the west bank of the Mississippi River in Vacherie, Louisiana, Oak Alley Plantation was built in the late 1830’s by Jacques Roman. Nine years later in 1848, Jacques died of tuberculosis leaving his wife Marie Therese Josephine Celina Pilié Roman (aka Celina) in charge of the estate. Besides the fact Celina was incapable of running a sugar plantation, she had an extreme problem with spending which nearly bankrupted the business. 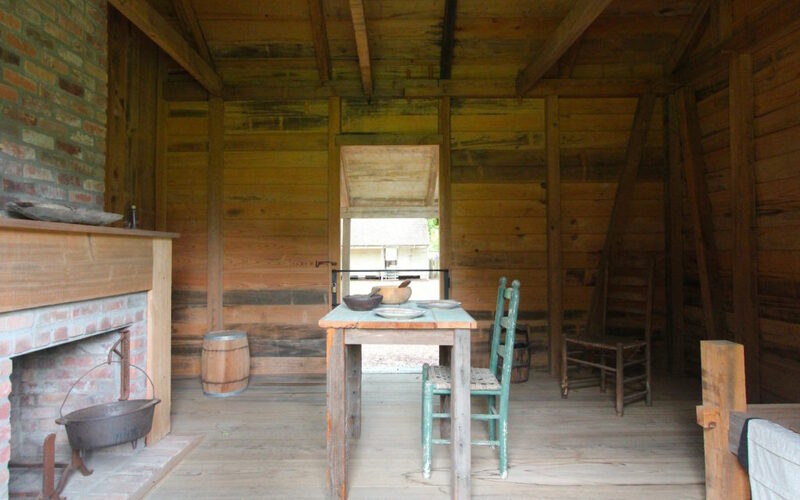 This lead to her son, Henri taking control of the property in 1859 in hopes of getting things back on track. Although Oak Alley didn’t suffer from any physical damage from the Civil War, like all plantations, it did suffer economically. Between the family’s debt and the end of slavery, Henri’s efforts to save the estate were failing. The family was forced to sell the plantation at auction, where it sold to John Armstrong for a $32,800 ($480,000 in today’s money). From there, the property changed hands several times and began to fall into disrepair. For a while it was even inhabited by a herd of cows… Not kidding. During a bad thunderstorm, the cows managed to break into the abandoned plantation house and there they lived for 12 years – destroying the Italian marble that once covered the entire first floor. It wasn’t until 1925 that the mansion and it’s 1,200 acers were bought by Andrew Stewart for $50,000. Andrew and his wife Josephine renovated and modernized the house running it as a cattle ranch and later reintroduced the growing of sugar cane. Following Andrew’s death and shortly before her own on October 3, 1972, Josephine decided to create a non-profit foundation known as the Oak Alley Foundation. 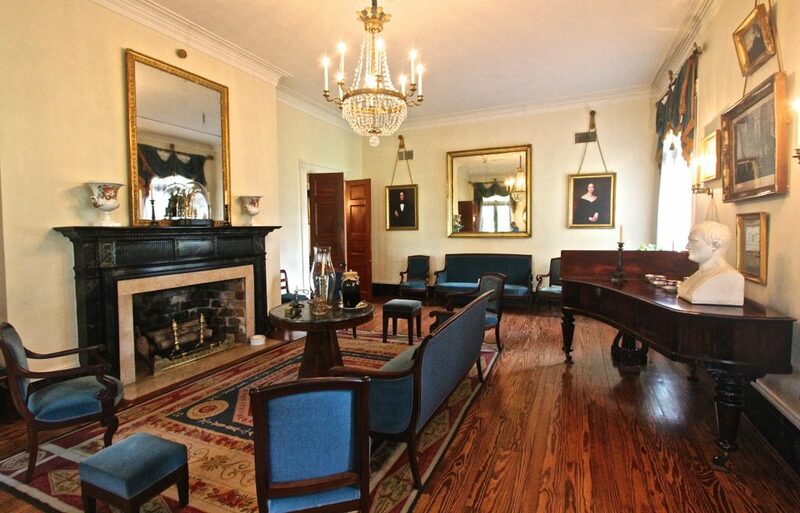 Donating the home and 25 acres of land, the purpose of Oak Alley Foundation has been to keep the historic home and grounds open to the public. What I love about Oak Alley is that it does not hide it’s history. It is dedicated to teaching visitor’s of the Plantation about life on the plantation in full – from the grandiose life of the plantation owners to the daily life of Oak Alley’s enslaved community. Wandering this section of the grounds visitors are able to check out a house slave’s cabin, a field slave’s cabin, a post-emancipation residence and a sick house. It was interesting to learn about the difference in work, treatment and clothing between the house slaves in comparison to the field slaves. The work was not as physically demanding, however their work did not end until the plantation owners went to bed. They were responsible for watching the children, cooking dinner and running errands for the family. For this reason – house slaves were dressed well to reflect the plantation owners social status. Field slaves faced grueling 12-14 hour work days… which I would imagine was unbearable in the hot and humid Louisiana summer. One plaque even discussed the inadequate food rations provided by the Roman family, which resulted in slaves growing their own gardens and raising their own animals to make up for the stingy rations. Add the efforts in tending to their own gardens and raising their own animals after a 12-14 hour day in the fields… sleep doesn’t sound like something they got much of. I was surprised to learn some slaves sold what they grew back to the Roman family. The small source of income helped them buy young livestock and other necessities to further provide for their own families. Although slavery is no doubt one of the darkest periods in our history as a nation – the stories from this time period are important ones to tell. Oak Alley does a fantastic job of covering the history of the plantation as honestly, accurately and tastefully as possible, which I believe is an important element in making sure we never repeat the failings of our past. 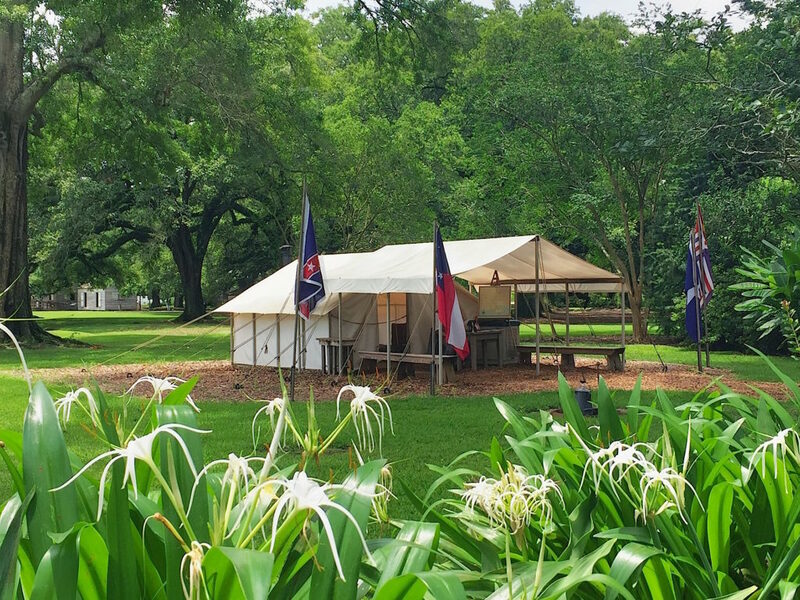 On the grounds of Oak Alley plantation you will find a Civil War encampment, which consists of a commanding officer’s tent. I was told all the artifacts in the tent belonged to Confederate General Richard Taylor. The encampment was one of the many reasons I wanted to return to Oak Alley. I hoped that visiting this section would give me a better idea of what life might have been like for my ancestors who served. 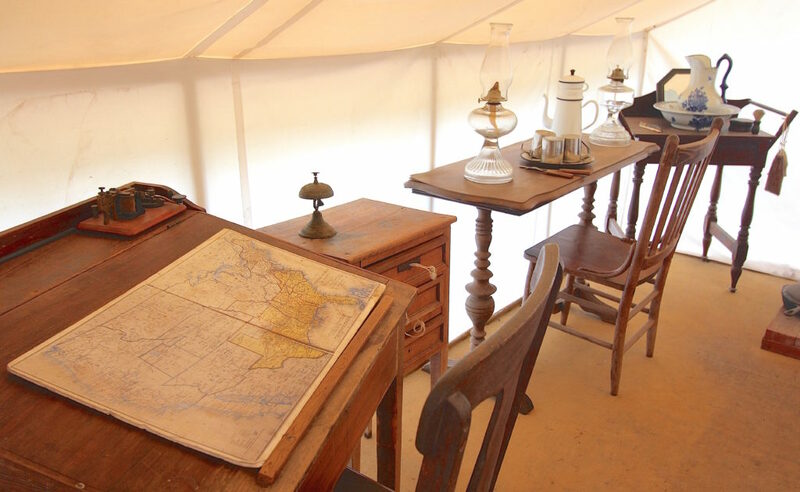 Stationed at the camp was a man dressed in Confederate uniform, who was able to give me some background on the tent and all the artifacts inside. I was surprised to learn the tent would have taken a total of two hours to put up and take down. While the tent was an example of a Confederate General’s tent, I was told a Union General’s tent would have looked similar. For my ancestor William and my other ancestors who served as privates, the best they would have had was a pop tent or a blanket and tree for cover. Between the unfamiliar climate and lack of cover – no wonder so many soldiers died of disease! Driving 20 minutes east from Holiday Inn Chateau Lemoyne, I finally arrived at the last stop of my journey, Chalmette National Cemetery. 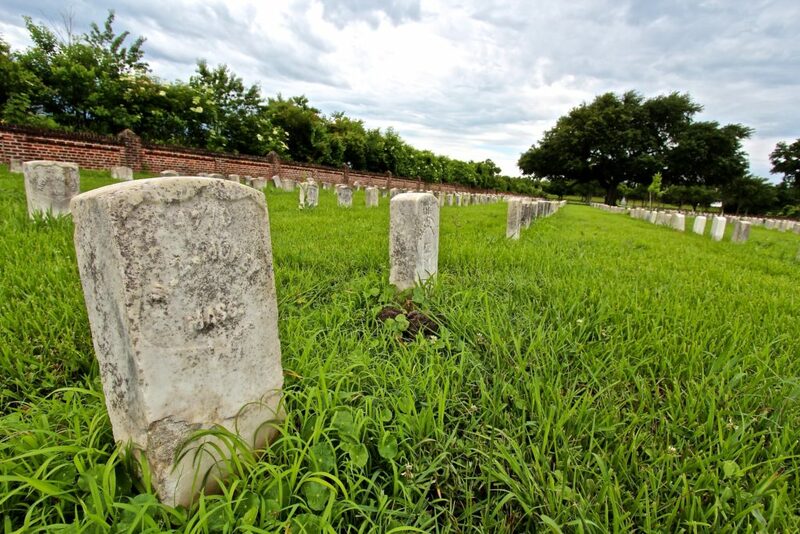 Originally established in May 1862 as Monument Cemetery, Chalmette National Cemetery has become the final resting place for nearly 16,000 soldiers and some civilians. Out of the 16,000, about 200 of those are unknown – no names mark their stones, just numbers. Luckily, William Z. Morey was not one of those 200. In fact, like many others, William had been laid to rest at another location before being moved to Chalmette National Cemetery. The cemetery was long and narrow – I couldn’t get over how many headstones there were. There was only one road in and out making it easy to navigate but I still had no idea where to begin. Grabbing a printed self guided tour, I noticed there were only five highlighted graves… one of which was only 5 plot numbers off from William. After a few minutes of searching section 62 and 13 fire ant bites later (a story for another day), I finally found my 4th great grandfather, William Z. Morey! For awhile I stood in silence, wondering what it was like to be his wife Elizabeth… learning that her husband had passed and that her eight kids were then fatherless. I wondered what it would have been like for her, knowing that his body wouldn’t be coming home. Instead, he’d be laid to rest in some far off state. What kind of ceremony did they have for soldiers like, William – if anything? Having seen photos of his grave online, I knew other descendants had visited his grave… but did his wife or kids ever get the chance? Finally, how would he have have reacted to being known by and having his gravesite visited by a 4th great grandchild? Did William belly up to the bar at Tujagues? Did he care for the chicory or spend time in Jackson Square? Would he have had stories to tell about “Beastly” Butler or experienced poor treatment from locals for being apart of the occupation? Its clear to see the Civil War left it’s mark on New Orleans, which leads me to believe the War and New Orleans would have left a mark on my ancestor, William Z. Morey. I would like to thank Holiday Inn for helping me connect with my ancestor. Being given the opportunity to revisit New Orleans in this unique way, I can honesty say the city’s past and what I have learned about my ancestor’s time there has forever left a mark on me. Very well written and probably the first blog I’ve ever read. Personal connection breathes life into a place and I’m glad you were able to experience this destination from a fresh perspective. Great photographs too! Very good job and thanks for sharing. Thank you so much for reading, Ryan! I’m glad you enjoyed it. The trip was an eye opener for sure. Funny how many things we do out of habit or tradition without knowing/understanding the starting point. New Orleans was a fun place to flip as far as perspectives. Its a great city, with a lot to offer. Meant a lot to me to revisit with a new purpose. Keep them coming! Big World we live in with tons to see! Good luck on your next adventure! 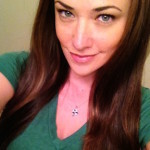 Always love reading your articles–I’m a history nerd and proud of it! Just returned from my 2nd trip to Gettysburg and have a return trip to New Orleans on the calendar for next March. I’ll certainly use your article as a guide to enhance my visit! These are, as they say, “bitter sweet” moments of your family history. Happy to have found him. Sad to know how his life ended without his family by his side. However, he must have been very proud and lucky to have you as the 4th great grandchildren whom bother to trace all the back and linking him to your family history. Keep up the great work! Great job, Kris. I am a Civil War history buff from New Hampshire. Have several ancestors who served in NH & Mass regiments, including some who “fought” in Louisiana. Let’s face it, most just went down there and contracted malaria &/or dysentery. One 18-years-old GGU of mine served with 8th NH Volunteer Infantry. He was wounded & captured in Louisiana, never to be heard from again. I imagine his remains are down there somewhere. Been to Nawlins many times. Where can one hear street musicians of that caliber? And the food! It’s my 2nd favorite city (Boston owns me). Anyway, I’ll close before this ramble gets totally obnoxious. I loved this article!